Coming to you this year Sunday 7th October 2018 - Clanfield & one of the UK's longest running Trophy Club Event now in it's 11th year. Past winners have included European Champions Elliott Boots & Darren Bloomfield. QUALIFYING EVENTS DETAILS**New for 2018 - Qualifying event winners (May and August) will get automatic entry into the 'A Final' for the relevant classes to the main DirtMasters event in September, anyone attending a qualifying event will then get half price entry to the DirtMasters main event in September. All entrants, and Pit Crew/Marshalls MUST have BRCA Membership. Trophies for top 3 winners for all classes, top 3 Clubman's in the 1/8th RallyCross Class, Plus a Glass Engraved Shield for TQ in 1/8th RallyCross. Prizes: Winner of the UK DirtMasters 1/8th RallyCross will receive Free Entry for life at following DirtMasters events. Winner of the 1/8th RallyCross Clubman will receive Free Entry to Clanfield RC Rounds for the following year, including Free Entry to the next DirtMasters event. 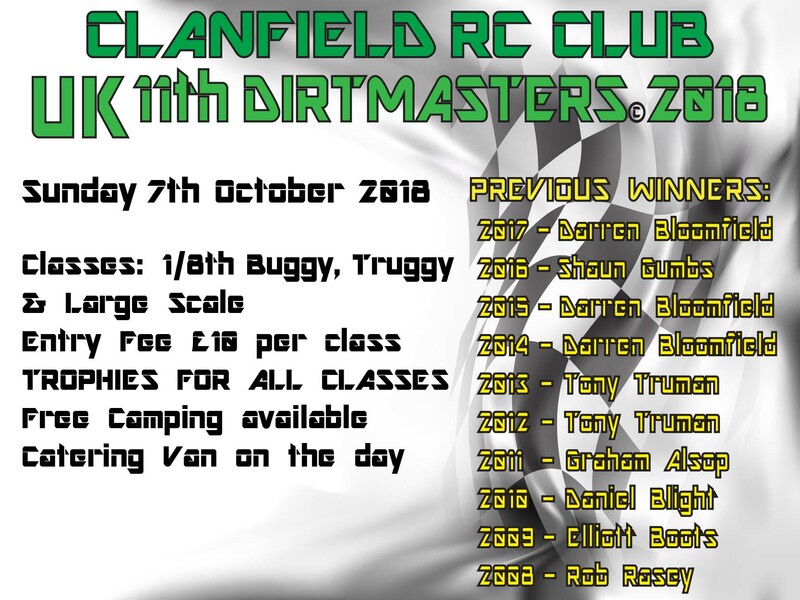 Winner of the Large Scale will also recieve Free Entry to Clanfield RC Rounds for the following year, including Free Entry to the next DirtMasters event. We have already secured our usual lovely Catering Team - Carolyn & Bill of Bills Burger & Snack Van. Free camping will be available on Saturday evening - but please do contact us prior if you plan to camp so that we can arrange site access and parking layout 07850 187566. Unfortunately at present there will be NO PRACTICE on the Saturday due to planning constraints. Details for the Race Date are Gates open at 8.30am, booking in will close at 9.30am followed by Drivers Briefing. Practice and first race will start at 10am. "If everything seems under control .... you're just not going fast enough"